Using sponsorships to drive existing loyalty programs is nothing new. However, using sponsorship to drive competitive bidding among your most loyal customers is relatively uncommon. 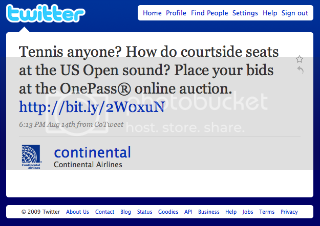 Continental Airlines, with over one hundred official affiliations (see below), uses their One Pass auction site to allow One Pass users to bid on exclusive experiences for the events they sponsor. The auction site was re-launched in 2007 by Paragon Marketing as a way for their client to promote relationships with their partners while providing added-value to OnePass members by offering them a unique way to use their OnePass miles. For instance, some U.S. Open court time and breakfast with Virginia Wade here in New York during this year's open will currently set you back 68,500 One Pass miles. 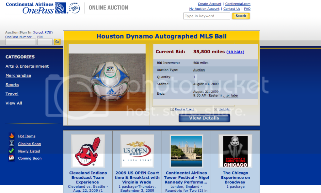 A Houston Dynamo autographed MLS ball will set you back 22,000, if you're the 19th and final bidder that is. Experiences offered in the past have include On-field Baseball Clinic at Yankee Stadium, First Pitch Experience at a Houston Astros Game, New York Giants Tailgate Party, Walk-on Role in Broadway Plays including Chicago’s WICKED and a Steamboat Vacation Package. Properties with pie in the sky valuations may want to take a close look at how valuable the experience they're offering is to Continental's customer base - prior to the pitch. The efficient market theory would suggest that the market will fairly determine the worth of each experience, in direct competition with Continental's other properties. Now sure there are other branding assets involved in almost all of these deals, but chalk that up as a whole new way to measure at least a portion of a sponsorship, relative to peer properties. Have you thought about unique ways in which you can use your property's most exclusive experiences to drive your prospective sponsors' loyalty programs? More importantly for sponsors, have you thought about alternative ways to measure the value that your most important customers place on your sponsorships? National: Official Airline of the March of Dimes Ambassador Program and Proud Sponsor of March of Dimes WalkAmerica. Official Airline of the Houston Astros, Houston Texans and the Houston Dynamo. Official Airline of the Alley Theatre, Asia Society of Texas, Contemporary Arts Museum, Children's Museum of Houston, The Cynthia Woods Mitchell Pavilion, Da Camera of Houston, Dominic Walsh Dance Company, Hobby Center for the Performing Arts, Holocaust Museum Houston, Houston Ballet, Houston Center for Contemporary Craft, Houston Downtown Alliance, Houston Symphony Orchestra, Houston Grand Opera, Houston Zoo, Jewish Community Center of Houston, Main Street Theatre, Mercury Baroque, Museum of Fine Arts Houston, Society for the Performing Arts, Stages Theatre and Theatre Under the Stars. Official Airline of the U.S. Open a USTA event, New York Knicks, New York Rangers, New York City Road Runners Club - ING New York City Marathon, and the New Jersey Special Olympics. Official Airline of Carnegie Hall, Lincoln Center, Inc., Live Broadway and League of American Theatres and Producers, TONY Awards, American Repertory Ballet Company, New York Foundation for the Arts, Joseph Papp Public Theater, Broadway Cares/Equity Fights Aids, Confrerie de la Chaine des Rotisseurs, Bailliage des Etats-Unis, The Premier International Food and Wine Society, State Theatre, George Street Playhouse, Two Rivers Theatre, NJ Theatre Alliance, Liberty Science center, NJ Jackals, Hambletonian Festival, Somerset Patriots, Association of Indian Americans, American Institute of Food and Wine, Star Chef, New Jersey State Opera, New Jersey Symphony Orchestra, New Jersey Performing Arts Center. Official Airline of the Cleveland Browns, Cleveland Indians, the Greater Cleveland Sports Commission, proud supporter of the Cleveland Cavaliers, Official Airline of the Rock and Roll Hall of Fame & Museum, Greater Cleveland Partnership, Positively Cleveland (Convention and Visitors Bureau), PlayhouseSquare Foundation, Greater Cleveland Film Commission, Cleveland Film Society — Cleveland International Film Festival, Great Lakes Theatre Festival, City Club of Cleveland, Town Hall of Cleveland, Great Lakes Science Center, Kaleidoscope Magazine, Urban League of Greater Cleveland, YWCA of Greater Cleveland, Dress for Success Cleveland, United Way of Greater Cleveland, Ronald McDonald House - Cleveland, Providence House, United Black Fund, Cleveland Play House, Kidney Foundation - Cleveland and Adoption Network.